Event Review: #CreateYourCourt by adidas Singapore (by Rebekah) | JustRunLah! Hold Court’, ‘#CreateYourCourt’ are words normally associated with Tennis. 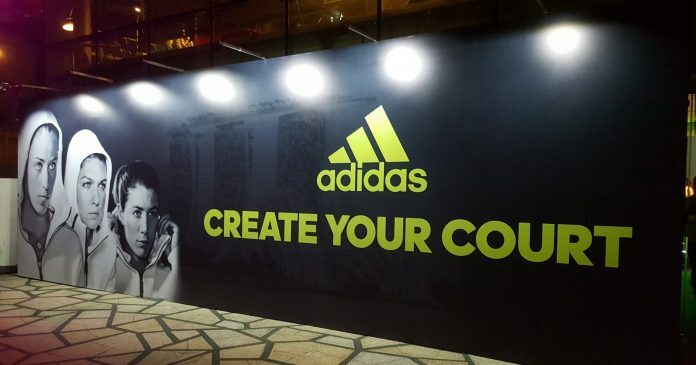 I came to know about this event when I was scrolling through Facebook and saw the #CreateYourCourt posted on Adidas page. Naturally I was curious and decided to find out more. #CreateYourCourt is a Women only event which encourages women to put their own spin on the rules, and transform their training. 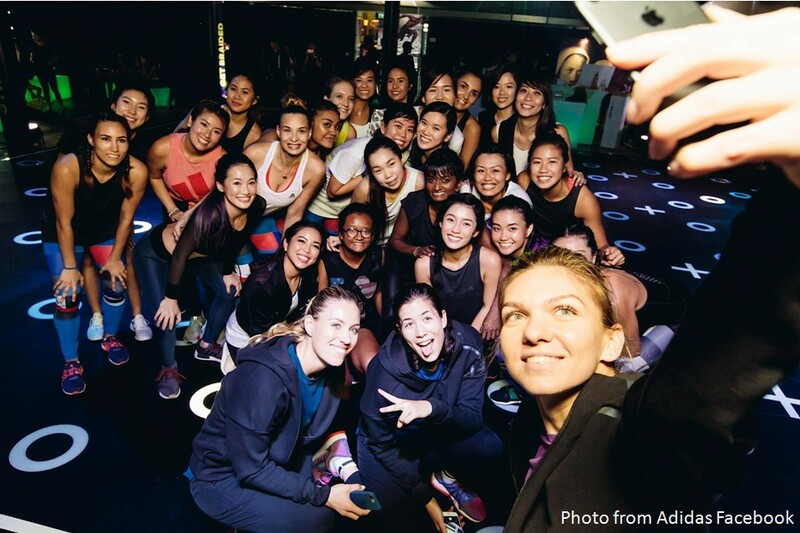 This event had also invited some of Adidas’ biggest global tennis stars — Angelique Kerber, Garbiñe Muguruza and Simona Halep, in an immersive and adrenaline-filled women-only workout experience in the heart of the city. #CreateYourCourt is a series of different workout events throughout the entire day on 20 October at The Adidas Court, The Pavilion – Far East Square. 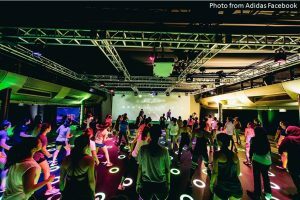 These 1 hour Workouts can be a Speed Training based on HIIT, a dance-based Mobility Training, a Power Training based on POUND®fit, or an hour long dance-workout finale led by Adidas Trainers and Creators. I signed up for the dance-workout finale and was lucky enough to get a slot. 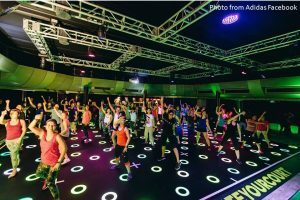 I read through all the classes brief write-up and thought this looks interesting and do-able hahaha… I’m not someone who dances or fancy going to a Body Jam class at the gym. In fact my class preference would be a Step workout class or an aerobics class but I thought, hey I should just be thick skinned and just try. If I don’t try I will never know. I decided to drag my friend Cheng Yee (CY) along since it’s more fun working out with a friend! We got our confirmation on Tuesday morning! 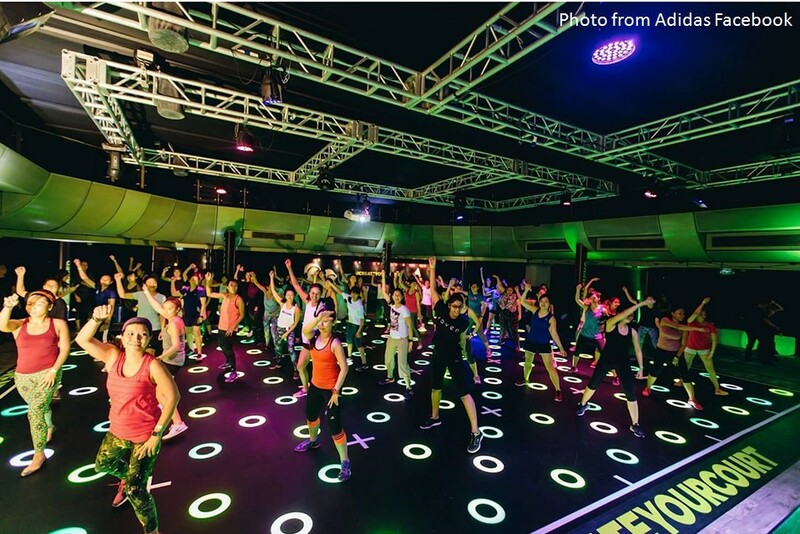 The Ultimate Dance-workout Finale is a workout inspired by Tennis that combines fly tracks which provide the peaks and troughs of intensity that you need during a workout! 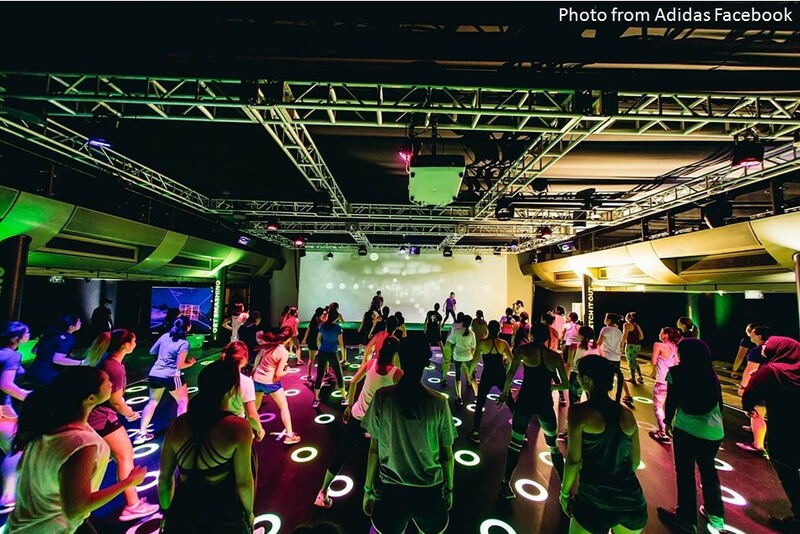 The music will also guide you through an immersive and infectious total body aerobic workout – ending the series of training sessions on a high note with adidas Trainer, Nor Dee Dee.Dee Dee is a professional dancer with more than 15 years of working dance experience. 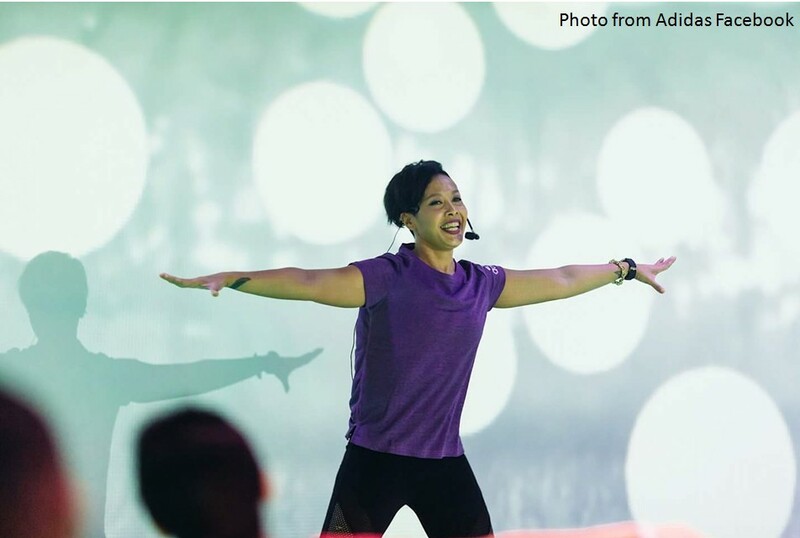 She was one of the first trainers to establish street dance as a regular activity in gyms, and has been recognised internationally for her work as a dance choreographer. She strongly believes that every dancer should find their own natural and achieved style. The dance-workout finale was scheduled to start at 20:30 hrs but participants were encourage to be there 15 minutes earlier. Dressed in our Adidas dance/ workout outfits, CY and me met for a quick dinner before heading to the Venue. 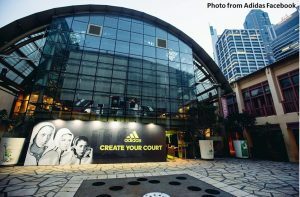 When we got to Far East Square, there were direction sign boards that lead us to The Adidas Court. I was so glad that they had those boards if not I think I would get lost. We happily registered ourselves and got a short introduction to what we could do before the class started. There was hair braiding services provided by Toni and Guys, a juice bar that will provide shots of fruit juice before or after each session, an interactive video game center and lots of photo opportunities. CY and Me decided to check out the juice bar first. They had really interesting combinations of juices and were really yummy drinks. After that, we decided to go around taking some photos around the area. 15 minutes passes really fast when you’re having fun! 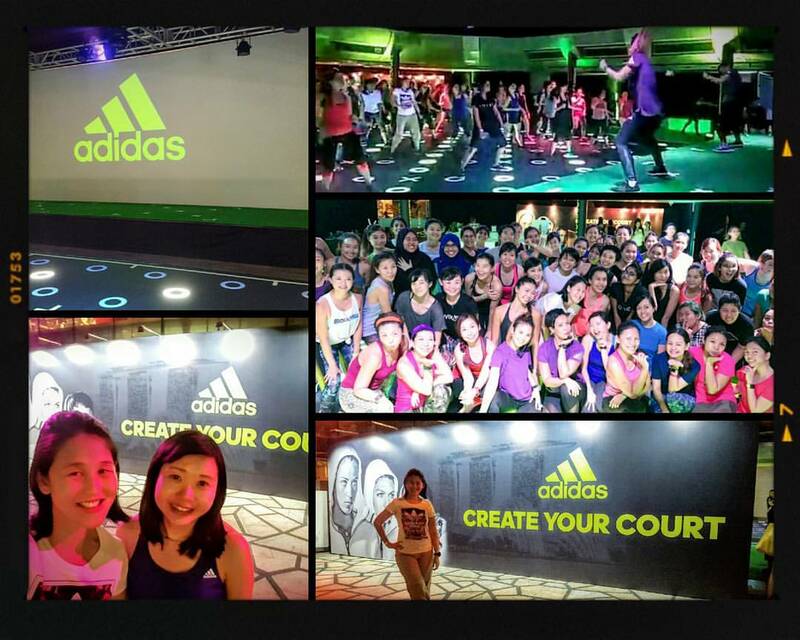 Soon Dee Dee was up on stage asking the participants to join her on the Adidas Court. 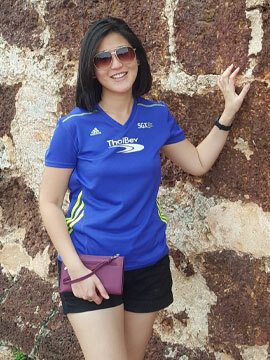 Like most Singaporeans, we are very shy so a lot of us huddled at the back but Dee Dee encouraged us to move forwards. I was a bit nervous because I was standing in like the thrird row which was pretty front and normally for dance classes all the very good dancers would stand in the front! I always felt like a penguin during dance classes because some moves were just hard to do. Warm up started with some simple dance moves like body rolls and dynamic dance stretches to slower tempo songs! That slowly build up to like a dance routine. Moves were fun and pretty simple to follow! What made the session even more enjoyable was the energy that Dee Dee brought to the class. The songs that she played were super catchy and fun! She also did a breakdown the dance moves so that beginners like me can catch the moves. We were all movin’ and groovin! What a party!! I sure didn’t feel like a penguin hahah… Check out the pics below! 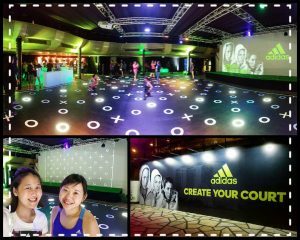 Photos are courtesy of Adidas Singapore. Soon the class ended and all us had that high! You know that feeling when you just completed a workout! Group photos were taken and that was the end of the session! Big thanks to organisers Adidas for the invite and Dee Dee who made the class soooo enjoyable. After that session, I can tell you I was quite inspired and may actually consider taking some dance classes. Till my next review! Have fun everyone! Click here for more post from Rebekah Ong.